Toothpaste is kind of like sandpaper. There are different levels of grittiness or abrasiveness. Do you know how helpful or harmful your toothpaste is? There are two primary functions of toothpaste. The first istoothpaste to remove stain without harmful abrasion to the teeth. The second function is to provide a highly polished, smooth surface which improves the appearance of teeth and health of the mouth. With all the hundreds of toothpastes out in the market and with the ever expanding market of whitening products it is crucial to evaluate the toothpastes we are using. Many toothpastes and especially whitening toothpastes may be very abrasive, removing layers of enamel and dentin from your teeth. The American Dental Association evaluates US commercial toothpaste formulas and assigns them an “abrasiveness rating” or “Relative Dentin Abrasivity” (RDA) number. 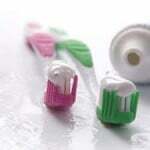 The ADA will certify any toothpaste with an RDA of 250 or less, while the FDA seems to prefer a lower RDA of 200. Knowing how abrasive your toothpaste is important if you have any recession, sensitivity, extensive wear, or notching on the fronts of your teeth. A lower RDA number is better if you have any of the previously mentioned symptoms. Please check our 12 Oaks Dental Toothpaste Abrasivity list! Do you clench your jaw? Grind your teeth? Does your jaw sometimes “lock” or feel stuck? These are just a few of the symptoms of temporomandibular joint disorder (TMJ/TMD), in the hinge joint that connects your lower jaw to the bone just in front of your ears. TMD in Austin may cause chronic headaches, swelling, problems chewing, or just feeling tired in your face. Because it can be hard to pinpoint the source of the pain, or even to know whether your symptoms are all related, you might think you just have to live with it. Nothing could be further from the truth. In Austin at 12 Oaks Dental, we use advanced technology to first diagnose and assess the extent of the malocclusion, or misaligned bite, and treat it with gradual and gentle therapies to bring your bite back into proper alignment. Remember, there’s no reason to live with pain and muscle tension that takes energy and pleasure away from everyday life. Call our Austin dental office at 512.346.5196 for an assessment of your bite. Place chicken breast in sprayed (or oiled) 9×13 pyrex dish. Sprinkle salt, pepper and garlic powder to both sides of chicken breasts. Sprinkle paprika on top side. In separate bowl, mix can of mushroom soup and whipping cream together. It will be a thick consistency. Then pour mixture over seasoned chicken. Sprinkle parsley flakes over chicken mixture. Bake at 350 degrees for 90 minutes, uncovered. Serve with baked potatoes. This makes a yummy gravy! Enjoy! One of the most versatile methods for restoring or refining a smile is dental bonding. You may have already experienced dental bonding if you’ve had a tooth-colored filling placed, or perhaps have had a chipped tooth quickly repaired. Dental bonding in Austin is nothing short of amazing in how it can be used. It’s hard to believe one therapy can be used for so many purposes! Dental bonding requires advanced training, technical skill and artful technique to create a bonded surface that is imperceptible from your natural tooth. It needs to be strong, match the color and translucence of your teeth, and form a tight seal that won’t allow any liquid or food to leak underneath it. Bonding doesn’t require as much tooth preparation as other cosmetic techniques. The tooth is lightly roughened and a primer applied. Then a custom-colored resin applied and carefully sculpted on the tooth. The restoration is then hardened using a special light, after which the resin is refined and polished. Many patients are skeptical the first time they experience dental bonding, until they look in the mirror! They can’t believe they’re looking at the same tooth. Dr. Worob and Dr. Cronin both have the expertise and artistry to place dental bonding that is imperceptible from your natural tooth. Call our Austin dental office right away at 512.346.5196 if you have a chipped tooth, so that it doesn’t become a big problem, or if you have cosmetic needs that you’d like to discuss with out doctors. How does this affect you directly? Well starting next month, March 2013. Grocery stores will no longer be allowed to provide plastic grocery bags. Yes, that’s right. The gentle reminder signs in the parking lots saying “Don’t forget your reusable bags” will also be implying- if you forget them you will have to load the brisket under your left arm, bottle of wine in your left hand, all your local fruits and vegetable and cars keys in your right hand and then squishing both arms together to support a case of Kleenex because Cedar Fever just started. Can I offer you an alternative? 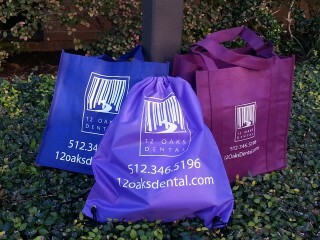 Stop by our office, 12 Oaks Dental, and pick up a free reusable tote from our office! Living in Austin is amazing! Austin has it all; a lush environment, great economy, advanced technology, its a growing foodie mecca, and a siren’s call for outdoor enthusiasts. We are known for its music(SXSW, ACL-Live, ACL music festival and all the live music every day) and being green. How green? Austin has a strategic plan to go Zero Waste by 2040. Let us help you do your part!